Of all the social media out there, my heart belongs to Twitter. I like its concise format – no giant walls of text to plow through. Twitter’s reach is better than Facebook’s. Anything you tweet will show up in the timelines of those who want it to. End of story. Here’s how to make Twitter work for you as a blogger. This post isn’t so much about how to achieve a million followers. That part is easy. Follow 2 million people. Statistically speaking, about half of them will follow you back. There you go. This post is more about how to use Twitter to make connections and promote your blog. For those who are completely new to Twitter, here’s how it works. Follow people, and then their tweets will show up in your feed. A blue check mark beside someone’s name means they are a verified famous person, though I can’t guarantee you’ll have heard of them. You can use the Publicize feature on WordPress blogs to automatically send a tweet with a link each time you publish a post. Don’t know whom to follow? Twitter can help. They offer suggestions based on those you have followed before and on the preferences of those followers. It’s pretty much the same algorithm Facebook uses. Sometimes it’s spot on, sometimes it’s not. I’d like to say the more you use it, the better it gets, but that would be wrong. “You followed a field biologist? Here’s another one for you. And another! You could follow ALL of them! No? You want field biologist who study frogs, not beetles? TOO BAD! You like rock bands? Here’s a geologist for you.” It’s all kinds of fun. But once you get started, you’ll find some peeps. An active feed. Sometimes people take a break from the internet. That’s no big deal. But if I look at someone’s feed and see that they seem to tweet only once every six months or so, I’m probably not going to give them a follow. On Twitter, I’m looking for the potential for interaction, so unless I know them personally, I’ll probably skip them. Varied content. I read a formula somewhere that explained the ratio of original tweets to retweeted stuff. I then promptly forgot it because that’s what I do with formulas. But the general idea is this – a Twitter feed should ideally be a mix of links to your blog posts, conversation with other Tweeters, and retweets (also known as RT) of other people’s stuff. A timeline that contains only tweets linking back to a blog doesn’t tell me much about the account holder. If they’re new to Twitter, I might follow them anyway. Someone who tweets only reviews of their books and the Amazon links to purchase them get skipped. I have definitely bought books (and music) from people I’ve discovered on Twitter, but that’s usually only after I get to know how they present themselves. An interesting bio. Be personable. And humble. If you’ve published a book, say so, but don’t belabor it. I prefer it when a writer links me to their website, not to Amazon. If you tell me the title(s) or have images of your titles as part of your header, I can find your work. There’s a place to link your blog, too. Be sure to do so. Conversation. I mentioned this under varied content, but it’s important enough to warrant a bullet of its own. Conversation tells me a few things. It shows that a tweeter is engaged on the site, and it gives me a clue how they interact with others. Spelling. I don’t care if a tweeter makes spelling errors. We’ve all done it, and there’s no way to edit without deleting the tweet and starting over. I will not, however, follow someone whose tweets are composed entirely using text-speak. My preference is in no way universal. Lots of people don’t care. But using it too often will pretty clearly define your demographic for you and limit your reach. A respectable number in the “following” column. Sometimes I come across accounts that have a number of people following, but not so many that are being followed. I like ratios that are fairly even, give or take twenty percent, unless they are a legitimate celebrity. Refusing to follow other people maybe means Twitter isn’t the best fit for them. Tweeps want at least a little interaction. Twitter is a useful tool and a pretty fun place once you get the hang of it. It’s more like speed-dating than an engagement, so don’t feel too badly if you lose a follower here and there. I wrote a post about Twitter a while back that contains some of my Twitter pet peeves. You can find it here. What do you like to see in a Twitter timeline? I’m @becomingcliche over there. I’ll be offline for a few days. I’m having minor hand surgery on the morrow, so I may not get to comments as quickly as I usually do. I’ll be reading them, but unless I can convince my husband to be my personal scribe, I’ll be quiet for a bit. Welcome to the third installment in my series on writing a blog, written for writers by an inveterate blog reader. If you missed the first two posts, you can find them here and here. The opinions herein are mine. There are endless guides for bloggers out there. Read a few and decide what works best for you. Use bullet points. Sometimes. Every how-to will tell you that people LOVE to read blogs with bullet points. And that’s true sometimes. Bold print helps to break up giant walls of text. Be aware, though, that very often, people will ONLY read the bold print. The shorter the explanation of the bullet point is, the more likely people are to read it. Also, not all blog posts lend themselves to a bullet format. Don’t limit yourself. Don’t hit “publish immediately.” This is a tough thing to do, but I recommend it. WordPress allows us to save posts as drafts and revisit them. Do that. Give yourself a little space from the post, anywhere from a few hours to a few days, whatever you need to see your work with fresh eyes. Then re-read. Not only are typos and sentence fragments more likely to jump out at you, having some distance allows you to read for clarity as well. If you aren’t sure you’ve hit the nail you were aiming for, use the feedback feature. WordPress lets us send a feedback link to anyone via email, even if they don’t use WordPress. The post will open for them and will look just like a live post so all formatting, photos, etc, appear in context. Linda A is one of my go-to editors. I trust her red pen. Find yourself a Linda. Edit. Put your best foot forward, every single time. The way most blogs are laid out, the most recent post is right there on the homepage for everyone to see. Make sure everything is all cleaned up. Root out any mixed up homophones and sentence fragments where you’ve cut and pasted and rearranged. And please, for the love of muffins, use paragraphs. I know. It’s not school, and we should feel free to format as we wish, but God created paragraphs for a reason. I rarely read blogs on weekends, holidays or particularly solemn occasions. I am usually too busy doing other things on weekends and holidays. As a blogger, I found this to be true as well. Hits were low over the weekend. If you’re a seven-day-a-week blogger, your weekend posts may get buried without many people seeing them. When there is an event of great magnitude, I turn off the computer completely. During mourning periods following a school shooting, racial injustice, etc, most of the stuff that is dumped onto the internet becomes senseless noise. I don’t read, and I definitely don’t contribute. Your readership will have natural peaks and valleys. Write anyway. This tidbit isn’t a tip, just a heads-up. In the summer, for example, page views may go way down. People are outside, on vacation, away from computers and devices. Write anyway. Write to improve your skills and, more importantly, to stay in the blogging habit. You can always reuse any gems later when people ARE reading. Next week I’ll start talking about social media for bloggers. Anyone out there use Pinterest or Instagram to promote their blog? Want to guest post, or at least give me some insight? Let me know in the comments, or contact me via email. This is the second bit of a mini-series on blog writing. If you missed the first installment, you can find it here. There are endless how-to posts about blogging out there. A quick online search for “How to write a blog” turns up 723 million results, and I do not pretend to have the be-all, end-all guide. I encourage you to read other posts on the topic to find what works for you. In this space, I’ll share what has worked for me, both as a reader and a blogger. 1) Watch the length of your posts. This is a brilliant bit of advice from Angelique at Sappho’s Torque. I agree. I prefer to read posts that are 1200 words or fewer under normal circumstances. 700 words is even better. It’s not because I have a short attention-span and am easily distracted (Here, kitty! Can I braid your hair?). It’s because shorter posts are frequently better-written. Not always. Not always. Not always. I follow some blogs that routinely pass the 2K mark, and I stick around because they are stellar. But more often, shorter posts tend to get to the point quicker and more clearly. In the words of good old Polonius, brevity is the soul of wit. It’s also the hardest thing for most of us to accept. We want to write something brilliant, something that will resonate with everyone. But think about it. There are seven billion people on this planet. That’s a lot of resonance for one blog. The better goal to aim for is that each time we hit “Publish,” we make someone (someone, not somebillion) laugh/think/smile/start a conversation. Negative comments happen sometimes. I have both read and written posts that hit someone’s nerve. The bigger your audience, the more likely you are to make someone mad. Comments can be unkind. It’s up to you to handle them in good grace, and to define what “good grace” means to you. Do you delete those comments? Allow but ignore? Allow and respond? You decide. But my best advice is to grow a thick skin and let it slide. Sometimes, worse than spawning a giant poop storm, a post is ignored completely and quietly dies. I bet every blogger out there has a post that didn’t get the attention they thought it deserved. It happens. But if one person got one thing out of it, maybe that can be enough. 3. Make your blog visually appealing. First impressions are everything. A blog appeals to me when it’s easy to find what I’m looking for, but it’s not an information over-load. Some things are a matter of taste, of course. Here are some suggestions for layout. Three must-have widgets – search, email follow, social media follow. Sometimes a post you wrote sticks in someone’s mind. Make it easy to locate. Also, an email follow button is appreciated. Clicking “Follow” at the top of a blog means that blog shows up in someone’s reader where it can get buried really fast. Give folks the option of appearing in their email inbox where they are more likely to see (and read) it. Social media widgets give readers more options for how to follow you. Choose a theme that is easy to read. No white text on black, please. Or that deadly “Google blue.” Show old eyes some love. WordPress has so many themes to choose from, and you can give them a tiny test-run before you commit. Many are free. Consider carefully the location of your widgets. Nine times out of ten, widgets that run down the sides of the page are more useful than ones clustered at the bottom. It’s a cleaner look, and the widgets are more obvious. I followed one blog for a year before I realized the widgets were all at the bottom of the page. Limit the number of posts that appear on a page. On WordPress, go to WP Admin>settings>reading, and then choose how many posts should appear. 10 or fewer is best. When a reader has to load every post you’ve written, it takes forever. Slow-load means fewer readers. One blog I love is Peas and Cougars. If you visit Rae’s site, you’ll see she has an attractive header and image widgets on the sidebars that are pastel and not too distracting. There’s plenty of white space and just enough going on to make it interesting. 4. Lift the seat before you pee. Whoops. Wrong…list… my bad. 5. Blog about what interests you. There is nothing more appealing than someone sharing something they really love. I love a fanatic. One of my favorite Tweeters is passionate about sports. I don’t know a futbol from soccer (see what I did there? ), but she does, and her enthusiasm (and sometimes rage) is entertaining and contagious. Some blogs have a focus topic tight as a laser-beam. I always know what to expect when I visit. Others are a mixed-bag, always full of surprises. Both can work well. 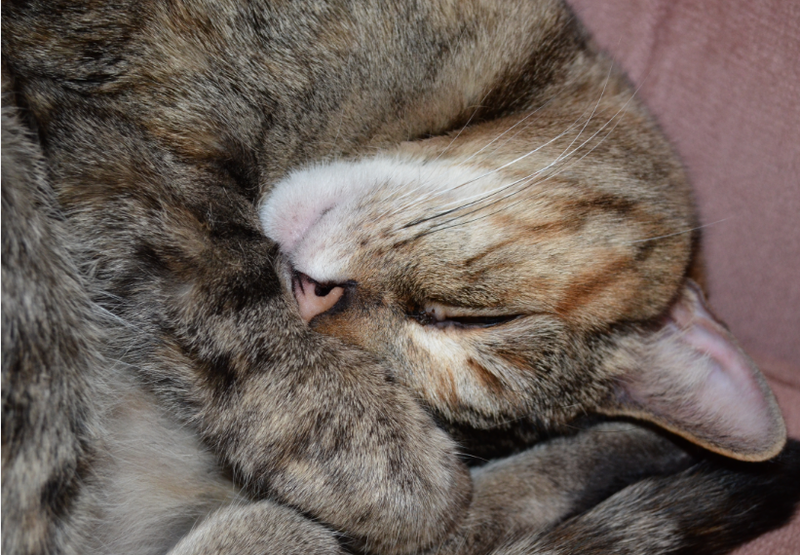 Alexandra began her blog taking photos of her exotic cat. Later, she began adding posts and a shop to raise money for homeless cats in her country of Montenegro, where there are no cat programs or shelters. She handled her focus-change neatly by adding a menu bar at the top of her page to help readers find the posts that most interest them. To learn how to create a menu, go here. So that’s it for this week. Next week, I’ll post a part 3, and then we’ll talk about blogging and social media. If you use Pinterest or Instagram to promote your blog, please let me know. I may go out on a limb and offer a guest post position on these two, since I don’t have direct experience myself. So, like everybody else on the planet, I made a few goals. Goals are nothing without action, and action comes only with accountability. Or something supercilious like that. Basically, I have happy things to share, so bear with me. One of these goals was to be more intentional about my eating. The Christmas season was a culinary free-for-all, and I’m paid for it in the end. My giant back end. There that is. Christmas technically lasts until January 6th, so I had a whole bunch of days before dealing with that one. But I have. I am eating a good breakfast every morning. And I must tell you that Belgian waffles with chocolate chips and whipped cream is a good breakfast. I would venture so far as to say it’s a great breakfast. What? Don’t look at me like that. There were strawberries, too. And some powdered sugar, and… I digress. Anyway, intentional eating has been a success. I’m being very conscious about my to-be-read list. It grows smaller daily. Mostly because I refuse to add anything else to it for a while. I am making a little headway. It’s hard to divide time between crazily devouring pages and crazily creating words of my own. But I have not brought anything home that I didn’t add to my TBR list. In fact, I have taken very little out of the free bin at my favorite used bookstore. And that, my friends, is progress. The bin is bigger than a coffin and has been stuffed to the brim with free books. FREE BOOKS! I have come to understand that free isn’t actually free, since it costs me bookshelf space to store. If I don’t have a reasonable intention to read the book in the next couple of months, back it goes. It’s almost like I’m growing up. I said almost. Don’t be afraid. And here’s my most exciting top secret news. I had planned/hoped/dreamed/wished to finish my current manuscript within the first couple of months of the new year. And (drumroll, please) now (Helloooo? Where’s my drumroll? Desk, head, keyboard. I’m not picky. That’s better. Thanks!) it’s done. The first draft, of course. It’s warty and ugly and not fit for human consumption (yet), but it’s finished. I’ll be moving into rewrites and beta-reading over the next few weeks, which is more exciting than I thought it would be. But am I content? No. I’m so ready to start another project! My husband thinks I should blog for a little while instead, but I think that’s mostly because he knows if I get involved in another book project immediately, we will never finish Downton Abbey. He’s probably right. I have a new goal, too. I want to rework my blog page and add some drop down menus and categories. This one will take me a while because I’m not sure I can make that happen on this theme. Changes are coming. It’ll be fun! So how is your list coming along? Oh, yeah. The title promised a cat. I meant it figuratively, as in letting out a secret , but when I looked at my latest upload of photos, there were 107 new ones, mostly of my cats. It seems I am missing Piper more than I thought, and my way of dealing with it is to take a blue-million snaps of the two cats we have left. Meet Kisses. Until I work through losing Piper, you’ll probably be seeing a lot of her. This is me every morning in winter. Every, single one. No, I’m not dead. I’ve just been busy. And right now I have to type really fast because I’m writing from my mom’s hospital room, and their internet policy is no personal websites. Although Facebook and Twitter are okay? I don’t know. Medicine doesn’t make much sense to me in general. Remember when I went hiking a few weeks ago? It was an eleven mile adventure, and it was fabulous. Unfortunately, I slipped a couple of times and did a little damage to my knee. One slip sent me tumbling onto my back, holding onto the cable embedded in the rock for dear life. Actually, probably literally for dear life, or at the very least dear not-broken-into-a-thousand-pieces. I hurt my knee, but it was cool. I had my hiking poles, so I managed to drag my sad, sorry carcass off the mountain complete the hike. I was a little sore the next day, but nothing unexpected. The muscles were tight, but I stretched them out. No biggie. Of course, a couple of days later, I noticed that I could no longer go down hills without my knee locking up. Or stairs. Or get out of bed. It hurt a little. I just kept a little heat on it via my rice sock, and I stayed limber enough to keep from screaming every time I stood up get around okay. Turns out, my threshold of stubborn is about two weeks. On day thirteen of the countdown, I was sitting on a high stool in a local restaurant getting a little wi-fi and breakfast. When I tried to get down, I nearly dropped the “f” bomb in the middle of Chic-Fil-A had a little more trouble than expected. I decided at that moment that if I could ever bend my leg again, I would head to the doctor’s office immediately. Considering that my only other option was to stay on that stool for the rest of my natural life, I limped my way to my car to get it checked out. It turns out there’s nothing too serious. I strained my lateral/collateral ligament. A few weeks of rest should get me on the road to recovery. Rest. Wait. I think I know that word. It involves walking my son to school every day and standing up in front of a class and teaching, doesn’t it? No, wait. It doesn’t. My activities have been sharply curtailed, so I’ve thrown myself headlong into my NaNoWriMo project, and I’m having the time of my life. My book this go-round can best be summed up as a splash of personal narrative that has spent time in a hyperbolic chamber. It’s not a memoir. I’m not sure there’s a verifiable fact in the whole thing, but it has been great fun putting a creative spin on some memories. Wait. There is one fact. I did use my real name, and my sister’s. I’ll post a little excerpt here sometime, maybe. I knew I had more words to say than just 50K this time, so I set my goal for 80K for the month. I turned out a 50K project last year in only 12 days, so I thought I could make it to 80 in a month. Leg propped up in bed, I made it to 80K this afternoon. Hello, my name is Heather, and I’m a bar graph addict. On my page, it shows me a little graph with a bar that indicates how close I’m getting to my next goal. The goals are set in increments of 20K, and I am completely addicted to seeing my little word count bar climbing. Someone needs to stage an intervention. I’m not sure my kids have seen me for three days, and the only one who still loves me is my cat. Because I’m her heat source. Anyone else doing NaNo this month? How’s it going? It’s the most fun I have all year, and I think I’m going to do it again in January! Internet is still out. Interesting that when I actually have internet access, I forget that I want to look up companies who can install it for me, which is how I come to be sitting in a Panera, covered in flour and chocolate from all the baking I’ve done for Squish’s fall festival to assuage the guilt for missing the event completely. Because I’m going to miss it. I have a date. Tomorrow, after I teach my toddler class at the zoo, I will make like a cow patty and hit the dusty trail. In about 24 hours, I’ll be turning into sj’s driveway. There’s a balloon there to show me just where to go and everything. Amy will be there. And I am so nervous. I’ve know sj for four years. We’ve exchanged emails daily for what feels like ever. She knows the ugly things about me. She has known me at my worst. But we have never actually met in person. I’ve followed Amy’s blog for over a year. I won her book many months ago, and I’ve been email her for quite some time. She is witty, charming, and her writing is delightful. I heart her dearly. But we’ve never met, either. I know how to meet people. I’ve met people thousands of times in my life. When I’m leading tour groups, I meet dozens in one place. I know that routine. Exchange names, smile politely, ask about their work/school, move on to the next person: later, rinse, repeat. Easy. But what about people you haven’t seen face-to-face, but they were there for you when your beloved pet died, when you were hospitalized suddenly, when the job so wished for doesn’t materialize, when a child has a serious health issue? What are the rules? Can you bypass the polite smiles and move right to a giant bear hug? What if you have so many inside jokes (I imagine sj snickersnorting over “lather, rinse, repeat.” Long story, but let’s just say I’m more careful with my chat windows) that everything is an inside joke? And you love the same music, and you’ve talked books exhaustively, and they know you so well that their reading recommendations are NEVER off, and Eleanor and Park made you both weepy? Can you skip talking about the weather and move to eating food off their plate? I’ve done it once before, this meeting someone who was once only words on a screen, a few months ago when I meet Emily, and it was wonderful. It worked so well. I think it will work this time, too, and for the same reason. I suspect that Amy and sj are in person exactly as they are online. That’s one thing that draws me to their writing – their raw honesty. How does this all work? I don’t know. But I’m about to find out, and I’m so excited! sj and Amy, I’ll be seeing you ladies soon! You’ll know me by my Severus Snape t-shirt and my smile! Gratuitous baby tortoise shot. Because when I can’t share pics, I get shaky. On a computer screen, this pic is bigger than life-size. September 26: Internet mysteriously disappeared this evening. I can’t get the computer online at all. Coincidentally, our neighbors moved out this afternoon. We’ll miss them. September 28: Made a completely impulsive and unplanned visit to Chic-fil-a. Since we were going anyway, I took along the laptop. Seems foolish not to avail myself of the wi-fi since the cost is built into the price of the milkshake, anyway. Interesting how the kids don’t have a word to say to me all week, but as soon as the laptop is booted up, they can’t stop talking to me. And watching me. And trying to push me out of the way. September 29: Chic-fil-a is closed. It’s the Lord’s day, so it seems reasonable to take a day of from the internet. Go to library instead. What do you know? Free computers! September 30: The Padawan has been without Minecraft for so long that he is now punching actual trees. He is vaguely surprised that no craft tables appear – only splinters. October 1: I wonder if the neighbors’ departure has something to do with our loss of internet. Maybe this means I have to get in touch with a cable company to have our own installed. Ironically, the only way to find their contact information is via internet. I take up basket weaving. October 2: Without the interwebs to distract me,I am reading at a rate of a book a day. But I cannot get online to catalog and brag about my accomplishment. What is the point? October 3: Focusing more of my time on rewrites. It’s rather like spending time with an ex and wondering what you ever saw in them in the first place. This is normal, right? I think 20% is good, and maybe another 35% salvageable. No way I’m finishing this thing and getting beta readers by January. October 4: Still no consistent internet. My Bitty Pet has starved to death. I might as well go to work. October 6: Haul laptop to Starbucks. Strictly business, of course. I need to plan out my trip this weekend to see sj and Amy and do a blog post so that my readers don’t think I have died. Although I’m pretty sure I need them more than they need me. Husband is pressuring me to get finished and leave, but I am WORKING. Bitty Pet has not, in fact, starved to death, but the little blighter betrays me with a poorly-timed *ding* Husband says it’s time to go. I needed a win this week. I’m in a bit of a rough patch. Rewrites are not going well at all. I’m experiencing a love-hate relationship with my novel. I vacillate between thinking this book might be my big break and feeling like I should scrap the whole thing before I embarrass myself at the beta-read stage. Stuff is not so great at work, either. Two of the computers I worked so hard to get set up are dead, less than three weeks after setting them up. They’re still under warranty, of course, but it means that I have to devote some of my precious writing time to getting them exchanged. And now my wedding ring is missing. I needed a win, and I got a big one. You might think my big win came from the reptile department. 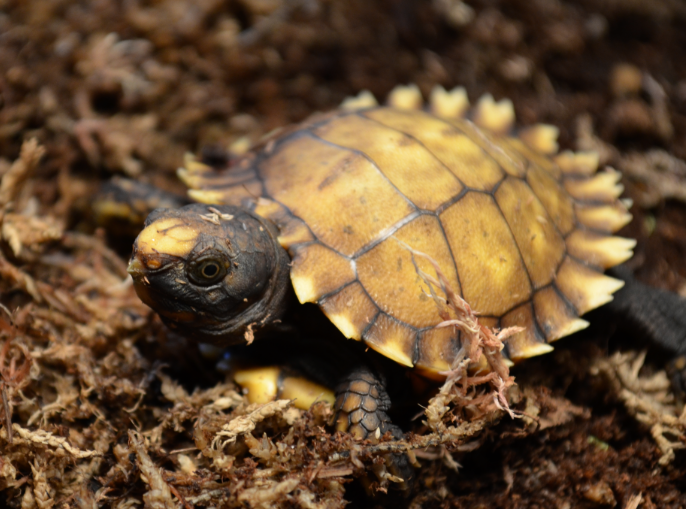 Six new Eastern Box Turtles hatched this week. Gave him a quarter and got change back. This one reminds me of Godzilla. There’s a huge size difference. The one on the left was incubated outdoors. That may just be a coincidence. You’ve got a little something on your shell, pal. No post is complete without a bellybutton shot. If those little splayed toes don’t get you, you need to see the wizard for a heart. This is good news, indeed. But it wasn’t my great news.There was something even better. Yes. there is this. Not a book, to be sure, but it’s a start. 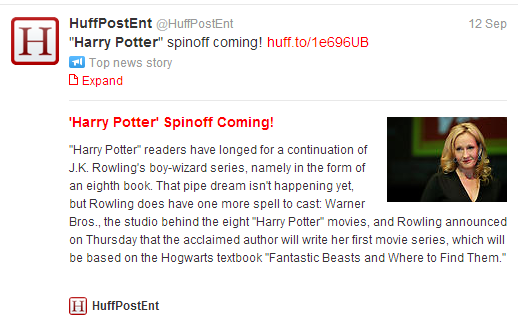 Better than a new HP movie! It is now official. In a month, I get the incredible opportunity to have a giant sleepover weekend with sj and Amy! I am not sure I can handle all the awesome. I feel like the universe has given me a gift.Two of my favorite people. In the same place. At the same time. Thanks, Universe! I needed this! Photo credit: https://www.robsimdb250challenge.blogspot.com I found this image when I searched “Jurassic park computer dude.” I love the internet. Not in the super-smart, intimidating kind of way. In the talking-to-himself, never-leaves-the-computer kind of way. And minus the killer dinosaurs and the candy (there will be NO eating around the new computers! Any questions? *insert psychotic death stare here*). By the time I got home at the end of the day, the last thing I wanted to do was sit at my own computer to do anything at all. On Friday, except for a couple of minor adjustments, I finished my project. To celebrate, my family and I went to the mountains to hike. Let’s just say it was a treat to be free of error codes and captchas. We were about twenty minutes in when Girl-child decided your garden-variety trail hike was too easy. She challenged me to take the rest of it barefoot. I’m pretty sure it was a double-or-triple-dog dare, and the honor of my entire family was at stake. Or maybe she just said “Hey, wanna go barefoot?” I can’t remember. I ate a lot of paint as a kid. On a dare. There might be a lesson there somewhere. 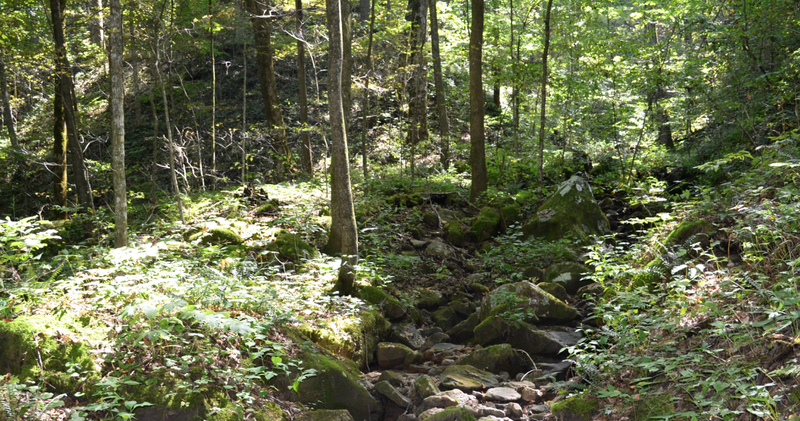 Anyway, the next thing I know, I’m stumbling over rock and bramble, my shoes swinging cheerfully from my husband’s backpack a mile ahead of me down the trail. Alone in the woods with nothing but the sounds of my own cursing the birds and kamikaze gnats, I had a little time to think. It came to me that barefoot hiking has a lot in common with the process of rewriting. I can’t cover as much ground as I am used to. Chacos securely on feet, I can trot down the trail at a respectable clip. The hike we did would take an hour, plus any time we spent playing in the stream.I can’t do that barefoot. Each step matters. Writing that first draft, I don’t watch where I put my proverbial feet. I just go, laying down the pages as fast as my imagination will let me. Rewriting means slowing down, carefully picking out that next step. I will see things I may have otherwise missed. A slower pace has its advantages. 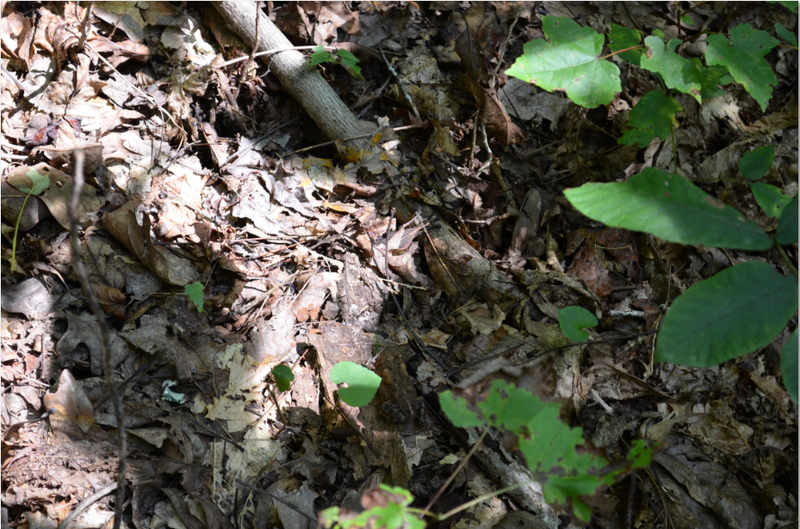 By checking out the scenery around me on the trail, I may discover things. 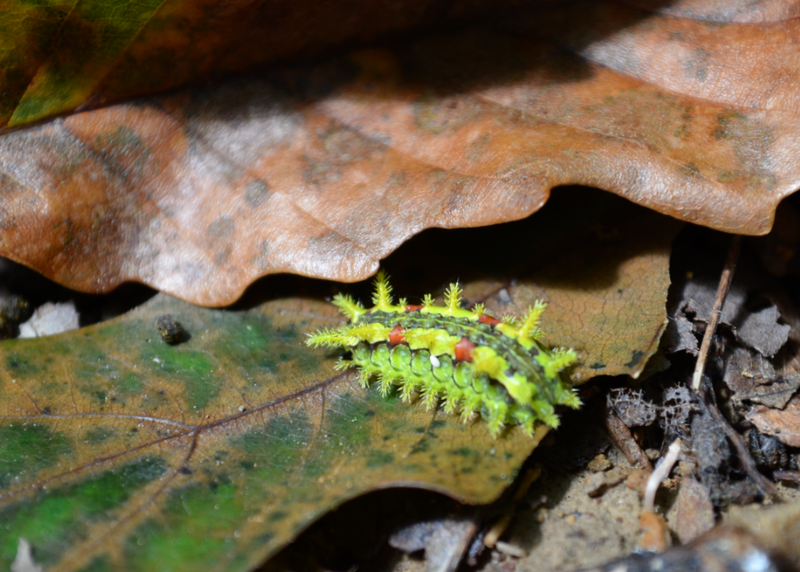 This caterpillar was about 1/2 inch long. The guys missed it because they were moving too fast. I don’t know what species it is. A Google image search tells me it’s sushi or a quiche. Oh, well. Win some, lose some. Rewrites force me to slow down and look at the details. Is that bit of dialogue lame? Was that scene in keeping with my characters personality? Are my descriptions adequate without going overboard? I get the opportunity to pull back and look at the big picture, too. Sometimes it’s good to look at the plot as a whole. Is the path clear? Is it taking my reader where I want them to go, or is it leading them straight off a cliff? Are there too many side trails where they’re going to get lost? Sometimes I find hidden treasures. It’s a pile of leaves, right? Of course not. Do you see it? Look again. It took about 5 minutes for me to find it, even though I KNEW it was there. See him now? Or her. 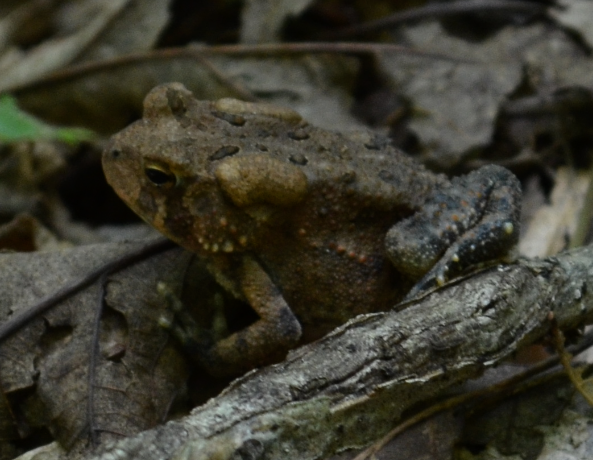 I’m pretty sure this is a juvenile American toad. There’s no better feeling than re-reading something I have written and coming across a passage that makes me so proud that I can’t even believe I wrote it. Those little gems make the effort worthwhile. And finally, it hurts a whole lot more. I ended my barefoot stint aching in muscles I don’t ordinarily use, feet filthy and bruised. Rewrites can bruise my heart. That precious scene in the diner that made me laugh out loud as I wrote it? Yeah, it was superfluous. It’s gone. Sometimes a whole character that I fell in love with the moment I birthed them has to go, or at least has to be stripped down to the bones and rebuilt into someone different, someone that better fits with what I’m trying to say. I think it’s pretty safe to say that I’m not in a hurry to repeat Saturday’s hike. To quote Patrick Henry, “Give me shoes, or give me a piggyback ride and a foot massage.” Rewrites aren’t my favorite thing, either, but I’ll buckle down and do them.They’re necessary to get to the next step. By January, I want to have the manuscript whipped into good enough shape to begin querying agents. Go ahead. Double-dog dare me. See what happens. A few weeks ago, I got the most exciting email from Emily at The Waiting. Maybe you know her. She’s been Freshly Pressed a time or three. Anyway, she said she was coming to my town and wondered if we could meet. Um, yeah! So exciting. 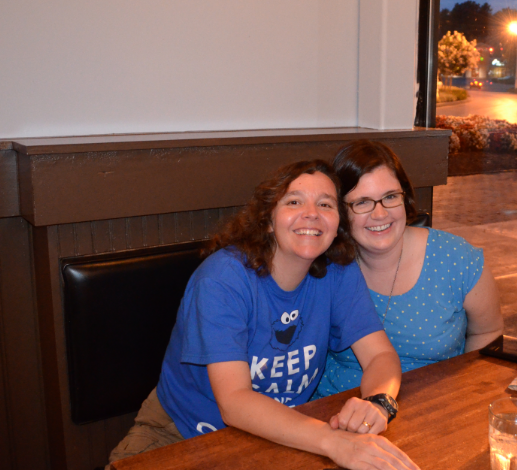 I’ve never met up with a fellow blogger in person before. So many feelings! Would she like me? Would we find lots to talk about? Would she murder me with chopsticks and stuff me in the trunk of her car? Like being in high school all over again. Anyway, the lead up was pretty eventful for me. 2 weeks out: Awaken in the middle of the night with the sudden notion that I am actually scheduled to work the night she is in town. It was just a dream, little champ. You work the week before. Go back to sleep. Ten days out: Where to eat? In this mid-sized town, there are surprisingly few good, local eateries that are easy for a non-native to find. Do we go for small-chain Indian food, or the hipster sandwich joint? One week out: Awaken in the middle of the night and ponder what to wear. Something classy, of course. So, Cookie Monster T-shirt or Slytherin Quidditch? This is a question to be settled closer to the event, after consulting a star chart, the Psychic Friends network, and the dirty clothes hamper. Two days out: Awaken in the middle of the night and remember that one reason I blog is because I am socially awkward and not so good with humans. 10am – I have a few hours. With artfully applied sunscreen and a bit of luck, I can even up this farmer’s tan. Or if I’m dressed as anyone other than Professor Trelawney? 4:30 PM : The tire is flat. This is not good. It’s just flat on the bottom, though, the rest of it is still nice and round. Maybe it’s not the worst. 5:00 PM – Tire is going to take two hours to fix. There is no wi-fi here, and therefore no way to contact Emily to tell her I may be late. 5:05 PM – Minor melt-down in the Wal-mart automotive department. People snap a couple of pictures for the People of Wal-Mart website but otherwise just step over me and go on about their business. 6:00 PM – Car is rolled out of the bay. And around the store. And up the block. And I think possibly to the next town over. 6:15 PM – Keys are dumped on the counter and I pay for my two new tires. Because husband likes to buy them in twos. They’re best in twos. I try to use the same logic whenever I buy snakes, but he doesn’t fall for it. 6:45 PM – I’m on my way! I’m on my way! I’m on my way! The restaurant serves hipster with a side of pretension, which is great because I’m starving. 6:46 PM – Crap. I forgot to brush my teeth. Oh, well. I eat a pile of mints. I also forgot to brush my hair. I hope keys work okay in a pinch. 7:00 PM – Butterflies are apparently carniverous and are consuming me from the inside out. Will I be interesting enough? Will I find something to talk about besides the mating habits of Dwarf Malagasy tortoise species? Will I be in the right place? Will she recognize me? Is there toilet paper stuck to the bottom of my shoe? Is my skirt tucked into my waistband? I’m not wearing a skirt. Why am I not wearing a skirt? I look like I’ve been sitting in a Wal-mart automotive department. 7:15 PM – There she is! I would recognize her anywhere! And she’s smiling. And not in the laughing-at-me-on-the-inside kind of way! And it was great. We met, we talked, we ate, we talked. The food was good, the company even better. I’m happy to say that Emily is just as wonderful, open, gracious and witty as she is on her blog. It’s always wonderful when art imitates life. If you ever get a chance to meet her, I recommend it. And if you’re in my neck of the woods, look me up. I’m relatively harmless, and I’ll bring Moonpies!